Laramie, WY – The magic of the home win versus Boise State two seasons ago was nowhere to be found Saturday night in Laramie. There was no safety dance and from an offensive standpoint, there were barely any first down signals from the referee. The Broncos dominated the Pokes from start to finish on a night where the crowd of 22,271 wanted so much to be a part of the game remembering the atmosphere of that 2016 Wyoming victory. The crowd was taken out of the game early though as Boise jumped to a 7-0 lead with 9:39 left in the first quarter on a 13-yard rush by Alexander Mattison. Boise would build their lead to 14-0 in the second quarter on a 21-yard pass from Brett Rypien to WR AJ Richardson. Wyoming’s next drive would only last six plays and gain 21 yards before the Broncos would march down the field again making the score 21-0 on a 2 yard TD rush by Kahill Shakir. Boise would make the score 24-0 with 35 seconds left in the first half after the Broncos blocked a Tim Zaleski punt at the Wyoming 43 yard line. The first half could have been worse but Boise State missed a 38-yard field goal following a Wyoming muffed punt. The Pokes stormed to life on their first play of the second half as running back Nico Evans ran the ball for a 75-yard touchdown to make the score 24 to 7. That would be the closest the Pokes would be all night though as Boise would answer with a field goal on a 16-play, 66-yard drive on the following series that took five minutes and twenty-two seconds off the clock to make the score 27-7. The teams would trade touchdowns in the fourth quarter with Boise striking for a 41-yard touchdown on a Rypien to Hightower pass and Wyoming with a 72-yard pass from Tyler Vander Waal to James Price to make the final scoreline of 34 to 14 Boise State. The opening series set the tone for the game. Boise State ran six plays getting to their own 46-yard line where they faced a 3rd and 11. The Cowboys would hold Boise to just a 4 yard gain but a dead ball taunting penalty by Logan Wilson resulted in a fifteen-yard penalty that gave the visitors a first down. The Broncos would score just five plays later taking a 7-0 lead and would never look back. Wyoming head coach Craig Bohl on what he was concerned about after the game. – Wyoming is now 1-12 all-time vs Boise State. With Boise State in Wyoming’s Mountain West Conference division, the Cowboys must find a way to be competitive and often beat the Broncos if they want to contend for the conference championship on a regular basis. This means recruiting and developing athletes who can go toe to toe with the level and brand of football Boise State has been successful with for many years. 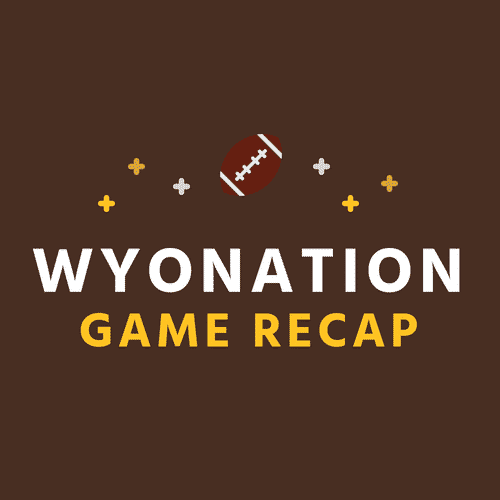 – The Wyoming offense was very poor on converting third down (converting just 2 of 11 chances) and the Wyoming defense was very poor in stopping Boise State on third down (Boise made 11 of 20 opportunities). This would prove to be a disaster for the Cowboys as it resulted in the Broncos having a 40:13 to 19:47 time of possession advantage. Wyoming can’t win games in this fashion especially against a team as talented as Boise State. – Tackling, tackling, tackling. The Wyoming defense can’t play at the level they want to (last season’s version) if they don’t clean up their tackling. The tackling in the first half was especially bad as the Broncos built a 24-0 lead that was ultimately the undoing of the Pokes. They looked scared to tackle the Broncos ball carriers in space wanting to avoid giving up the big play but that cam because of their timidness. Wyoming (2-3, 0-1) will be on the road for one of the longest road trips a college football team can make. The Pokes will be taking on Hawai’i (5-1, 2-0) in Honolulu with a 10pm kick-off on October 6th. The game will be televised by Spectrum Hawai’i.